Fair Libertys Call blends the music and dance of the Revolutionary War era to tell a story that is both rooted in historical fact and timeless in appeal. This show brings to life a time and a people who are too often rendered as stock figures. Discovering in her research that America, and New York especially, had a very sizeable Loyalist population, Pamela Meadows determined to make this a key feature of her plot. Disdaining easy answers, the playwright intends rather to give all sides a say, and to respect the choices made by our Eighteenth Century forebears. This is a side of history very different from what most of us learned in school, both more complex and more comprehensible. We can see ourselves in the characters who meet in the Widow Edwards tavern on that night in 1775. 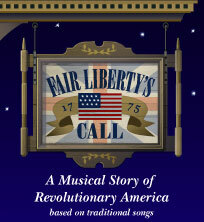 Combining familiar tunes and little-known events, Fair Libertys Call offers a rare glimpse and a fresh new look into the struggle behind our nations painful birth.